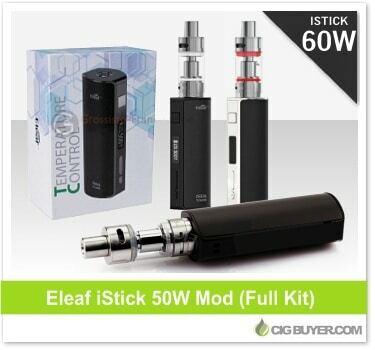 The Eleaf iStick 60W Mod is the latest offering from Eleaf; offering up to 60W of power and temperature control. It’s the first iStick to use a replaceable 18650 battery, and it’s sold as a kit with the Eleaf Melo 2 Sub-Ohm Tank. The tank offers 4.5ml of capacity, adjustable airflow and a super easy to use side fill design. The setup can be used with standard kanthal coils, or TC-Ni (nickel) and TC-Ti (titanium) coils; firing at resistances as low as 0.05 ohm.